While I used to listen to my mother’s John Coltrane and Miles Davis records when I was a young child, I discovered jazz for myself when I turned 12. My grandmother had given me a small portable AM/FM radio and fiddling with the dial I came across the radio station WLIB. This was 1966 — and at 4:00 each afternoon, Jazz pianist Billy Taylor opened his show with Herbie Hancock’s Maiden Voyage. What I waited and hoped for each day though was the chance to hear something by Miles Davis. Billy Taylor usually obliged with tunes from Miles Davis’ ESP or Miles Smiles albums or a song like So What from such newly minted classics as Davis’ Kind of Blue album. Years and years later training with Johnny Grinage down at Gleason’s, Johnny used to talk about Miles the boxer. 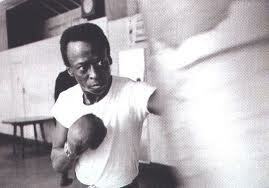 I’ve never really heard the speed-bag in his trumpet, but I still love the thought that the staccato of his solos could have come from his days of training in the ring.